As Winnie is showing in the above photo, that's more or less how much rags goes into each rag pet, in addition to a big lump of cotton batting. It's about one single bed sized sheet or half of a regular sized duvet cover, ripped to shreds. The older and more worn the sheets the better, I prefer the ones that are so worn you can almost see through them! They're so lovely and soft and they make the best stuffing. I get a lot of my old bedclothes from family and if I'm running short, I nip to the flea market for more. If the sheets have a very cool pattern, I save a bit to use for rag pet clothes. I do most all of the ripping on the balcony, since it makes a lot of dust and doing it indoors just means more dusting and vacuuming afterwards. I'd love to have some machine that'd do the ripping for me, since it's pretty tedious work to tear a big sheet to shreds and I'm pretty sure my lungs disagree with all that dust too. We did try using a paper shredder, but since fabric isn't as stiff as paper, it didn't quite work. I've also tried to find "shoddy" (shredded recycled fabric) online, but the smallest lot I've managed to find was 5 tons, and while it'd be super to have that much stuffing at hand, I'm afraid we don't have anywhere to store it! If anyone should know of a place that sells shoddy in small lots, I'd love to hear of it. As I mentioned in my previous post, I don't much like stuffing. 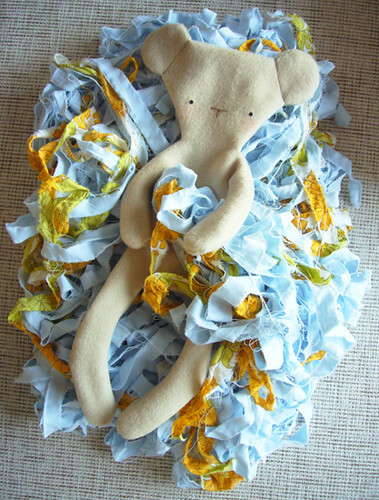 It's hard work and it takes up the most time in the whole rag pet making process. One thing that makes stuffing a bit more bearable is watching telly while doing it. Due to this I've gotten addicted to day-time TV and have thus discovered that talk shows are perfect companions to stuffing. I've also developed an addiction to audiobooks, because they allow me to combine two of my favourite things: sewing and reading. I go through about a book per week (if it's a long book) and I'm eternally grateful for LibriVox, my main fix for my audiobook needs. An other thing that makes stuffing easier is that I got some gorgeous organic cotton stuffing from NearSea Naturals a while back. It's really lovely and soft, yet there's a nice "firmness" to it, and I know this might sound silly, but it smells absolutely lovely too! And you don't need to use as much of it as you would ordinary, cheap-o polyfill, since the cotton has less air fluffing it up. 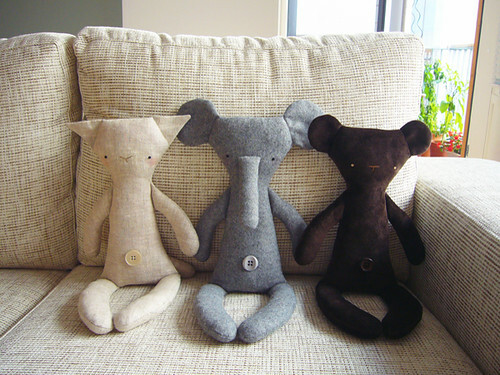 The Terrific Trio are the first rag pets to have the new cotton stuffing inside of them. Elephant is a little embarrassed by her lack of nose. I enjoy the whole rag pet making process, but there are bits that I like less than others. Like for example, cutting fabric. I'm even less keen on stuffing; I guess that any part that's hard on your hands isn't up there among my favourite parts. I do treasure my scissors though, they are after all my most important tools along with my sewing machine. 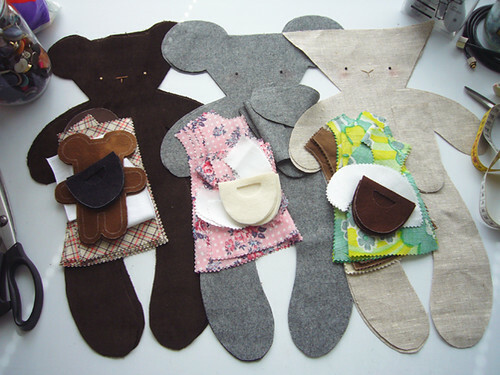 And I have quite a few pairs too, each pair dedicated to particular materials, since cutting the wrong thing with the wrong scissors will blunt them in a blink. Out of all of them, my pinking shears are my favourite pair, since they save me so much work and bother finishing raw edges. On the other hand, I absolutely love to pick out belly buttons for the rag pets. 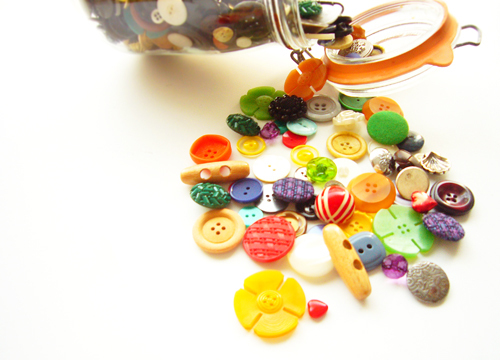 I have big jar full of buttons and I love rifling though them all, looking for that perfect button. I tend to buy one or two extra buttons every time so as to add to the jar. Yet despite this, I never seem to have the kind I need, much like with sewing thread! Although I admit that I am a little addicted to buttons and so I will never have enough of them no matter how many I have. :) I've been a button addict ever since I was a kid. I remember playing with my gran's button collection, happy as a pig in muck. My gran had a really fantastic treasure trove of buttons and I hope that some day my collection of buttons will be just as grand. Two of the Terrific Trio have old, vintage buttons I had set aside for them and one has a button I bought especially for her. 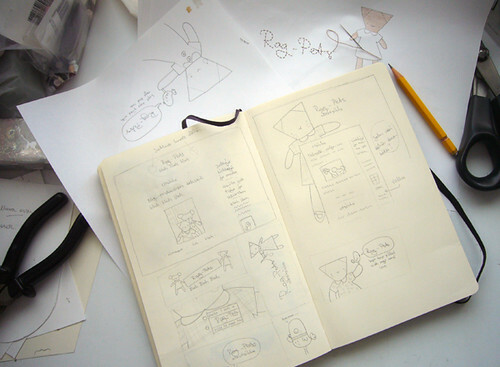 The rag pets are now on Facebook! If I'm completely honest, I don't quite understand how they got there, since technology confuddles me. Thankfully J. (my boyfriend and my tech support) knows which buttons to press and voilà! you can now become a fan of rag pets on Facebook, and then go play a round of Scrabulous (did you know that Sesquipedalian* is an acceptable word in Scabulous?). My sewing has come to a halt for want of purple thread! Why is it that no matter how much thread you have, you never seem to have the one colour you need? I've gotten to the habit of buying matching thread every time I buy fabric, but my local fabric store has switched from Mölnycke to Coats and since I've only read mixed reviews of this new brand, I'll need to go buy my thread elsewhere now. Sewing thread is one of the only things I'm brand loyal to, it's Mölnycke or Gütterman all the way for me. 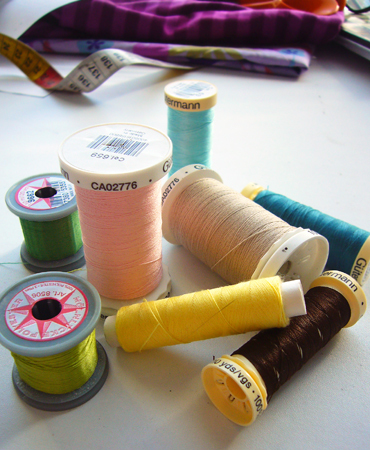 I do have a few spools of no-brand thread, but I only use those for basting, and there's no way in heck I'd subject my sewing machine to any of them. 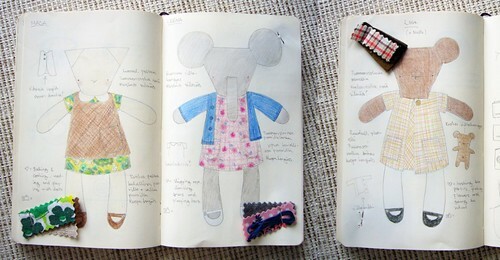 I'll be exhibiting at this years Plush You show! I've actually known I got in for good a while now, but since I'm still all giddy about it all and because I'll really and truly believe it only when I see it, I haven't really told much anyone. That and it's take a bit to get this blog/website up too. The names might switch about and the outfits might change a little still, but I do know that the Terrific Three will all have finnish names, they will be representing Finland over there in the big world after all. Welcome to the rag pets' home on the web! ... or what will be their home as soon as we get everything sorted out here behind the scenes. As you can probably see, there's still a lot of virtual wallpaper to be hung and a whole pile of virtual furniture to move, not to mention all the virtual moving boxes to unpack, but slowly & surely, we're getting there.